Scarred Ligaments and Retinacula: What does Scar tissue look like on MRI? 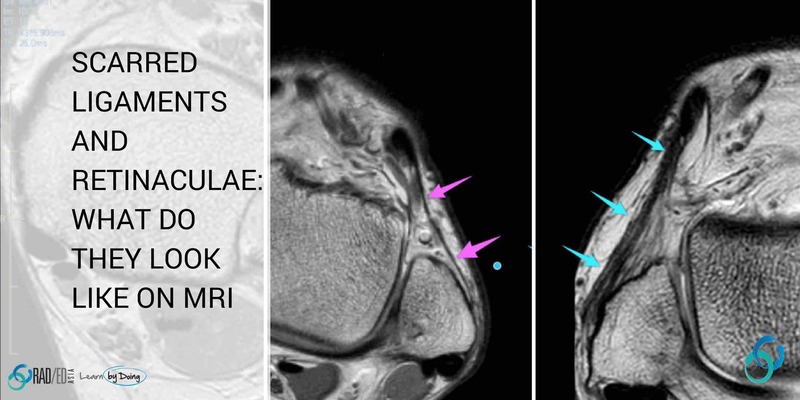 Ligament and Retinacula Healing: What does Scar tissue look like on MRI? What happens to a ligament when it is torn and injured? This is a brief edited summary from an article on the pathology of scar formation ( “Scar formation and ligament healing” link below). “After an injury… hemostasis is activated and a fibrin clot is formed within minutes. An inflammatory response ensues over the next 3 to 5 days, removing debris and attracting large numbers of angiogenic cells and fibroblasts. These cells begin to produce matrix, and formation of new tissue takes over as inflammation lessens over the next several weeks. In ligaments, collagen levels increase rapidly, reaching normal levels by 6 weeks. Ligaments begin to resist appreciable forces…as early as 2 to 3 weeks after injury. The healing tissue is remodelled by cells over several months and years, leading to fewer cells and vessels, with better collagen alignment…. However, the material properties of the ligament scar do not return to normal even after 2 years…. The scar tissue is weaker, larger and creeps more than normal ligament. ” Scar formation and ligament healing. Hildebrand KA, Frank CB Can J Surg. 1998 Dec;41(6):425-9. The important thing to note in terms of imaging is that scarred ligaments and retinacula are thicker and larger than normal ligaments. 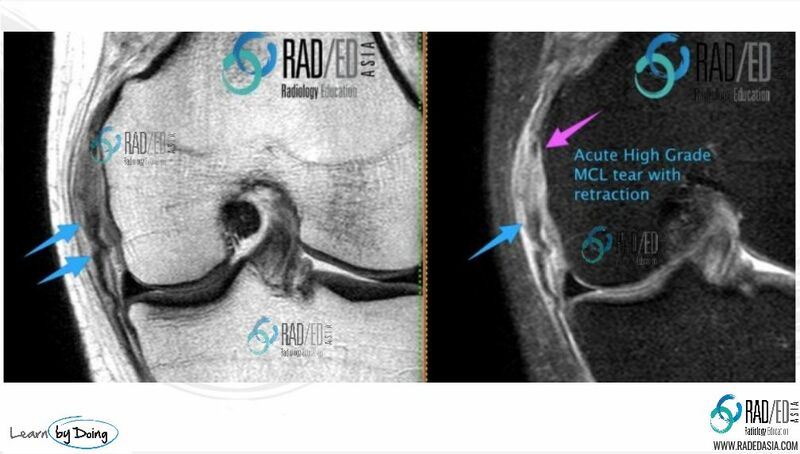 Image Above: Acute high grade MCL Tear ( pink arrow) with retraction of fibres ( blue arrows). Image Above: 8/12 later thick scar tissue has formed at site of previous high grade tear. Healed MCL is much thicker than a normal MCL which is the clue to it having been previously torn. Image Above: Different patient. 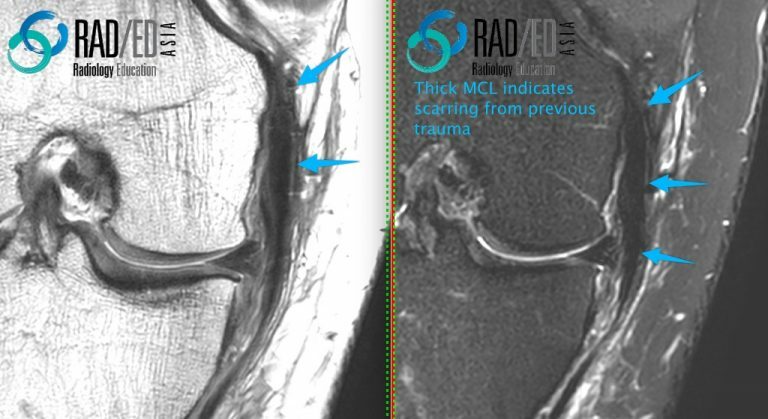 Markedly thickened and scarred MCL ( blue arrows) from previous trauma. Sometimes there is a very pronounced scarring of ligamentous injury and rather than just thickening of the ligament, there is marked almost mass like hypertophic scar formation at and around the ligament site which at times can involve adjacent tendons. Image Above: Severe hypertrophic scar formation superficial fibres deltoid ligament ( blue arrows thick intermediate signal structure) with encasement of adjacent tendons. Tearing of retinacula is more commonly seen at the ankle. 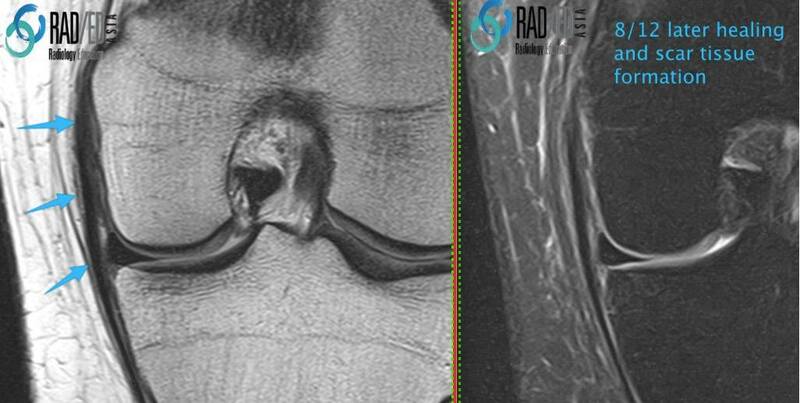 Again a previously torn retinaculum will be thickened and ill defined companred to a normal retinaculum which is usually thin and well defined. 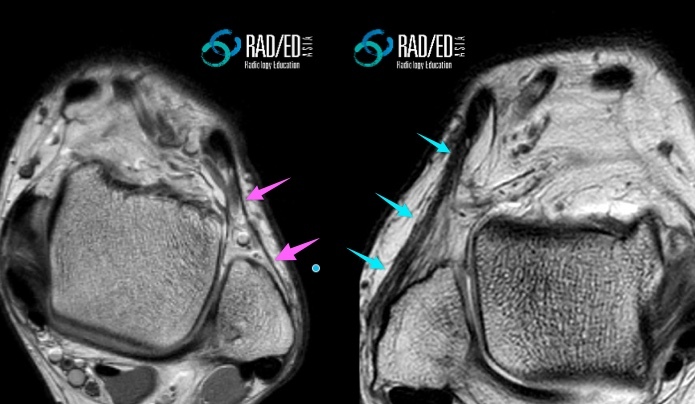 Image Above: Previously torn extensor retinaculum of ankle which is now markedly thickened and irregular ( blue arrows). Normal extensor rretinaculum ( pink arrows).